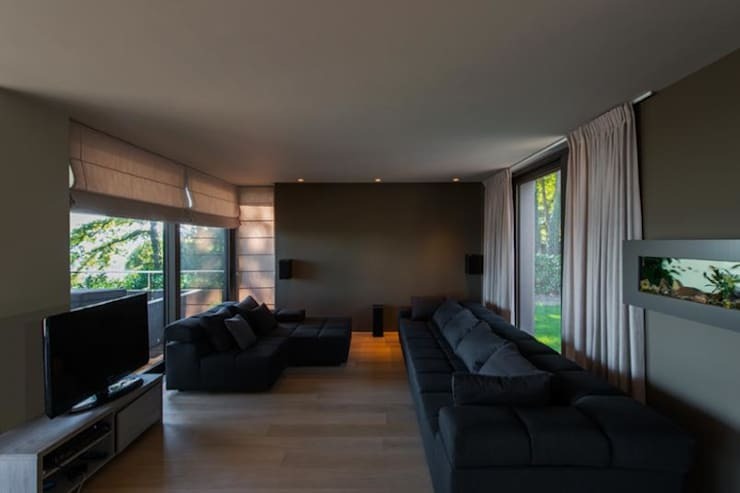 At homify, we love projects that are simple yet lavish, interesting but sleek and functional yet comfortable. This is why today we are delighted to present you this home, designed by professionals Buro5 Architects & Associates. Not only does it take on different perceptions depending on which way you look at it, but it even features a lavish swimming pool complete with sun loungers. As we explore this home, we will see how lavish design and simple concepts can coincide, resulting in a breathtaking final product. Let's take a look at just how incredible this beautiful home is! From the front of the home, we can see just how stylish and sweet the home. It features a mixture of materials, including brick, tiles, wood and plastered walls. The facade is complete in darker tones, which makes for a very elegant and sophisticated look and feel. 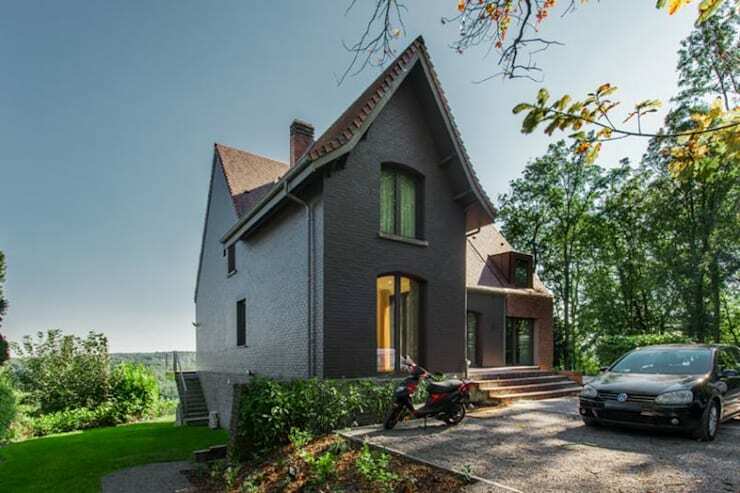 This is a modern home that merges with a traditional, country-style design. Here we can clearly see how the designers have worked with the beautiful surrounds, ensuring that the home has access to the panoramic views. There is also plenty of parking space, meaning that guests, family and friends can visit at all times. This is truly a welcoming and warm home that embraces the visitor and the resident alike. 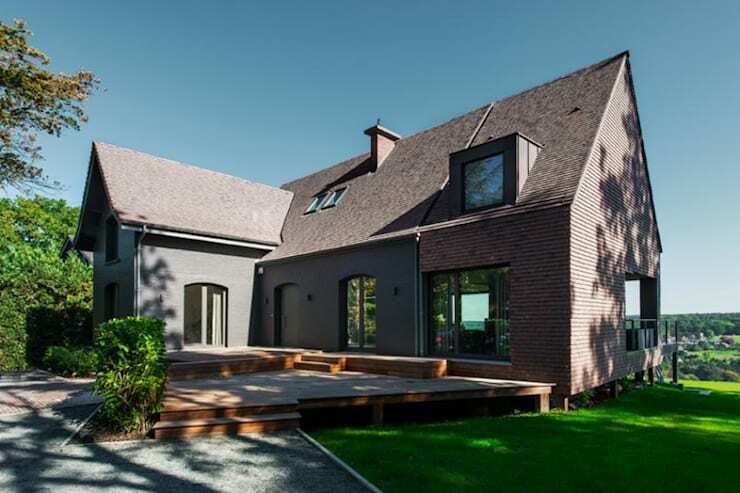 From this angle, we can see how the one side of the house is dramatically taller than the rest of the home, bringing a fairytale-like quality to the design that is enhanced by the steep roof. The designers have had some fun with this L-shaped building. 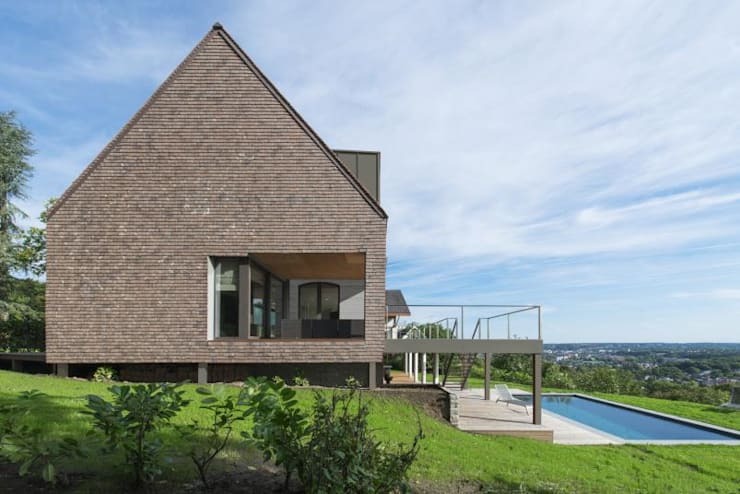 We can also see how the home features an abundance of windows and doors, connecting the interior spaces to the greenery and beauty of the outside spaces. This home also features a very welcoming entrance, with stairs that lead up to the sweeping front door, while the L-shape creates a little alcove of protection and privacy. Have a look at these tips for turning your ordinary driveway into a spectacular entrance. If we head to the back of the house, the architecture takes on a completely different look and feel. There are far more glass windows and doors on this side of the house because it's a more private area, allowing a beautiful relationship between the garden and pool area and the interior of the home. The house sweeps out onto large terraces, balconies and of course, the pool area itself. The swimming pool is simply lavish due to its size! This is a great space for playing with the kids, cooling off on a hot day or even doing laps for some exercise. The sun loungers complete the design of this space, combining beauty with function. Couldn't you imagine relaxing on one of these sun loungers with a good book? From this angle, we really get a sense of how the architecture works in harmony with the surrounding landscape, with the large upstairs balcony spilling out from the interior space. It features both a covered area as well as an uncovered area so that the outdoor space can be enjoyed in all weather conditions. We can also see how beautiful the traditional gable roof is from this side of the home. Sometimes a more classic style can be the most effective! If we step inside the home, we can truly see how simple and welcoming the entrance is. The marble floors are simple and practical, but at the same time lavish and luxurious. Marble is a great material for flooring as it is durable as well as elegant. 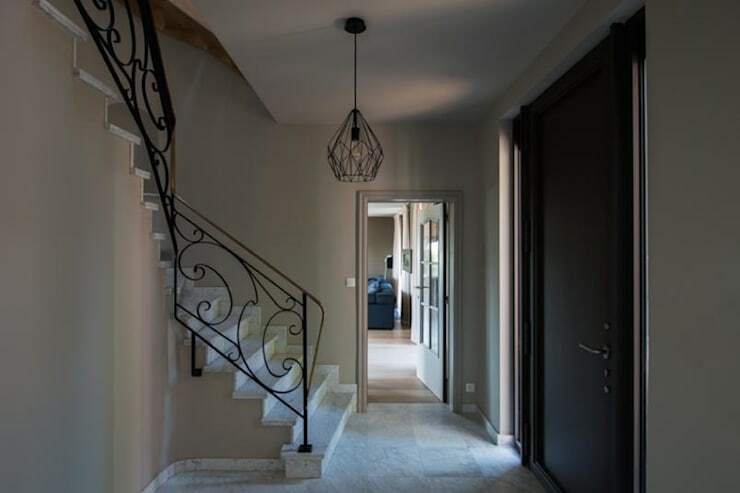 A stylish lamp drops down from the ceiling, illuminating this area in the evening, while working in harmony with the intricate and detailed balustrades that run alongside the stairs. This is a wonderful example of how functional collides with trend! 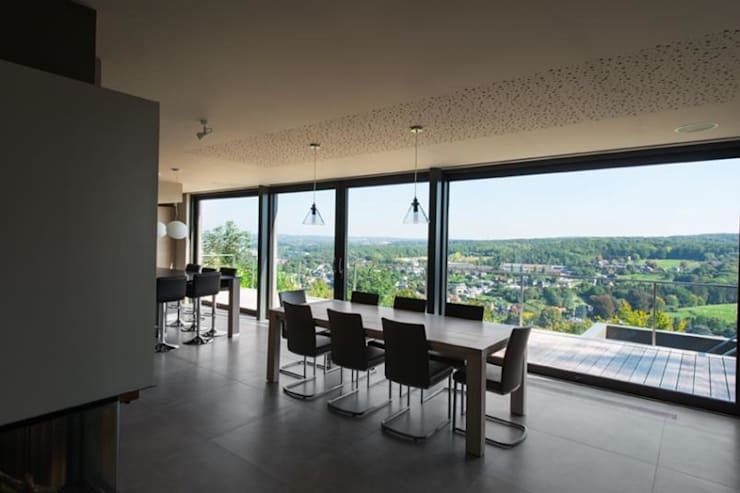 In this image, we can see how the open plan living space features one central focal point: the large glass windows that run alongside the entire length of the wall. This is a wonderful example of how natural light and natural beauty play a role in even the most sophisticated of designs. The open plan design creates a very spacious and expansive looking interior, while the neutral furniture is subtle yet homely and comfortable. From this angle, we can see how one of the walls in the living spaces features a stone facade, introducing texture and tone to the space. 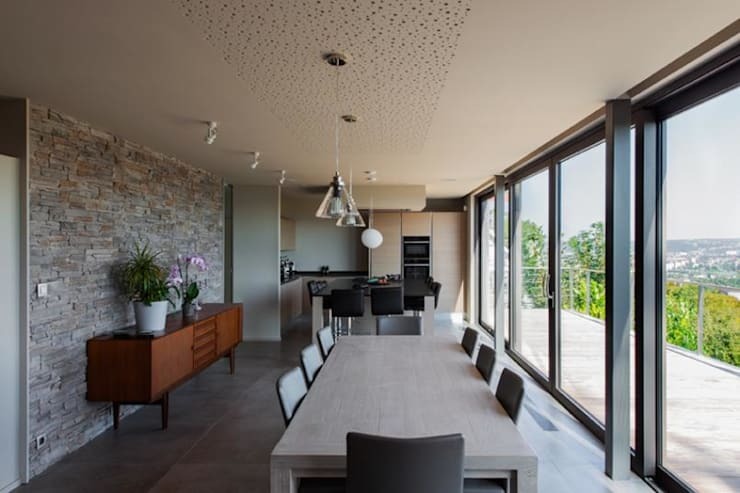 Raw materials such as stone and wood work beautifully in modern homes, connecting them to the exterior spaces. Have a look at how you can make your home roar with raw materials. Some pot plants or vases of flowers can also completely enhance an interior design, injecting a fresh touch of greenery and beauty. The living room is slightly more cozy and comfortable, with large and cushy sofas that look like they are calling for someone to take a nap on them! The curtains and blinds in this space allow for more privacy and allow the natural light to be filtered in so that the family don't end up with reflections on the screen while trying to watch their favourite film. The living room shows how comfort and style can co-exist with the dark grey, brown and beige tones creating a cocoon-like effect while ensuring that this space is still stylish and on trend. Before we go, we have to have one last glimpse outside onto the beautiful pool area! Here we can see how the upstairs terrace features a gorgeous wooden deck, where family and friends can use the stairs to head down to the lower deck to be closer to the pool area. Wood is a wonderful material for an outdoor space as it is durable, budget-friendly and looks beautiful and rustic too! If you like this home, you'll love this family home that's so beautiful you may have a heart attack. 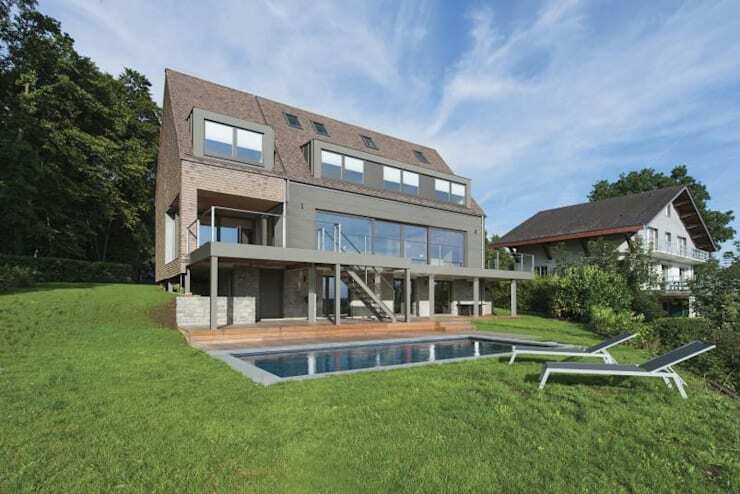 What do you think of this gorgeous home with a swimming pool?